This is part of a collection of non-RPGs that I personally love and am posting on here. A strategy game similar to Civilisation but conceived for mobile, Polytopia is just endless, replayable fun. It’s a “turn-based strategic adventure” where you discover new lands, learn technologies and conquer other tribes. Like Civilisation, the richness of your starting square can greatly influence your progress and success. (I cheat and reload if it looks too barren!) There are a few balance issues: I have found that building battleships basically wins all the time, you can just surround a city with them and fire safely from a distance, whereas units such as catapults seem kind of useless. Early choices you face may be whether to focus on ocean travel or road to explore more quickly, or focusing on mining and forges or farms and windmills to grow your cities. The game does have IAP to unlock different tribes. You start off with several choices included in the base game (which is free), but if you want others such as the cool “Luxidoor” with their huge starting city, or the “Aquarion” with their unique amphibious units that can travel by land or sea, you can buy the ones you want. 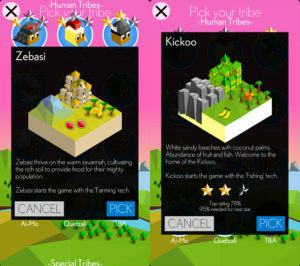 Each tribe also has different environment squares which adds colour and variety to the game. For example the “Zebasi” have watermelons and giraffes, whereas the “Kickoo” have bananas and leopards. All the cities and the monuments you earn for different achievements look different for every tribe. The devs are still very active on the game, and will hopefully add even more tribes and more content.